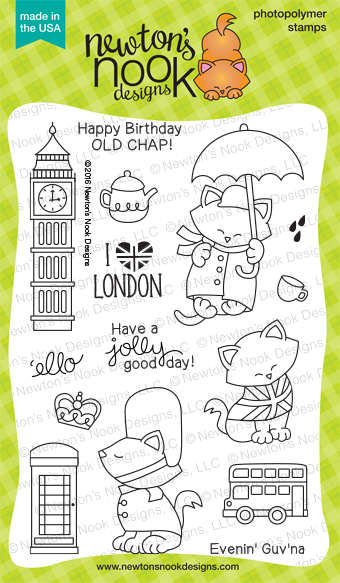 Today is our third reveal day for our March Release and we are featuring the new Newton Dreams of London stamp set! We are giving the stamp set away to one lucky winner so make sure you read all the way to the bottom of this post to see how to win! Newton is heading out on an adventure to London! 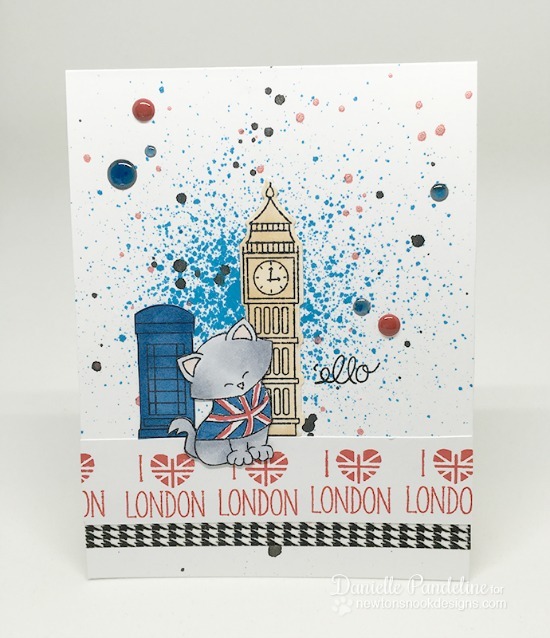 This adorable 4 x 6 stamp set features our favorite kitty enjoying the sites of London. It will be so fun to color the images of this kitty having fun dressing in a Welsh Guard costume, wearing a Union Jack t-shirt and floating away in the rain with his umbrella. 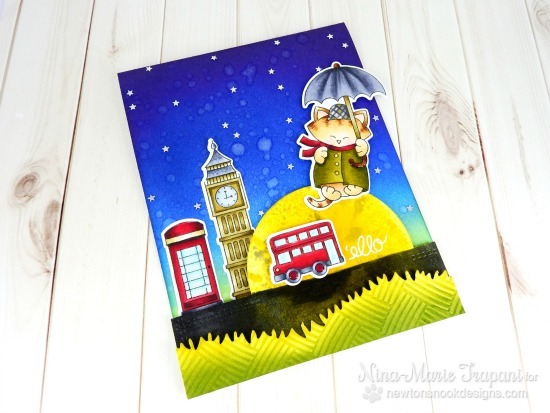 Use the images of the iconic Big Ben, the double decker bus and more to create fun scenes and backgrounds! This set also includes some fun sentiments will make great friendship and birthday cards! 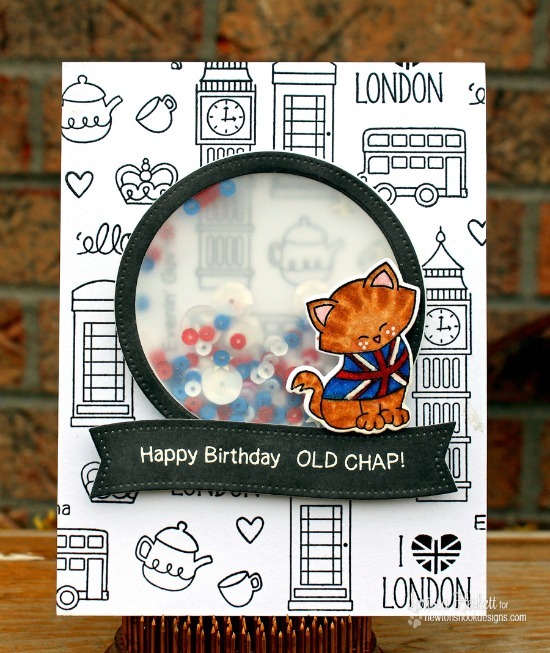 Travel to London with these adorable cards from our Design Team & Guest! Check out all the amazing projects below from our Design Team & Guest Designer below - Then, make sure to click through to all their blogs for details on their cards - Some of the designers have extra cards on the blogs and you might even find a fun video or two along the way! Make sure to comment for a chance to win! Details on the giveaway are at the bottom of today's post. Awww! This card by our Guest Designer, Kelly Latevola is so amazing! I love how she made the kitty look like Mary Poppins! What a fun night scene!! Wow! 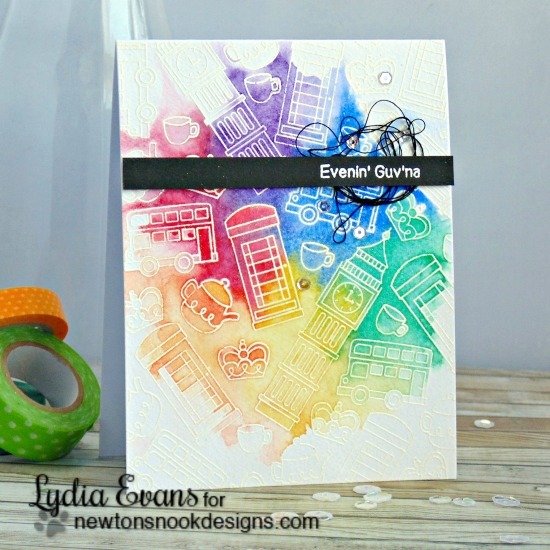 This rainbow watercolor card by Lydia is so incredible! 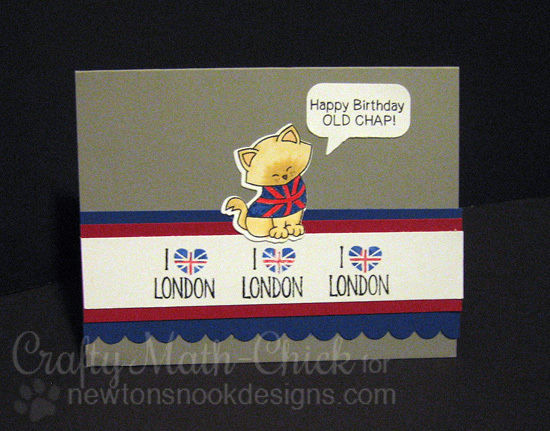 It's so cool how she embossed all the London elements in white and then colored over the center! 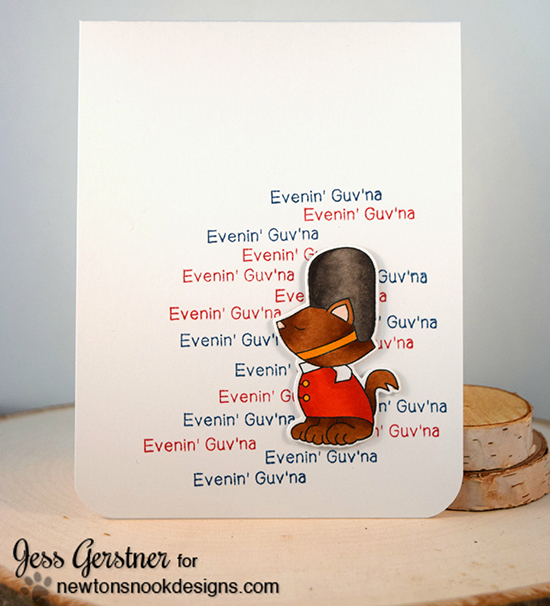 The "Evenin' Guv'na" sentiment on the black finishes the card perfectly! 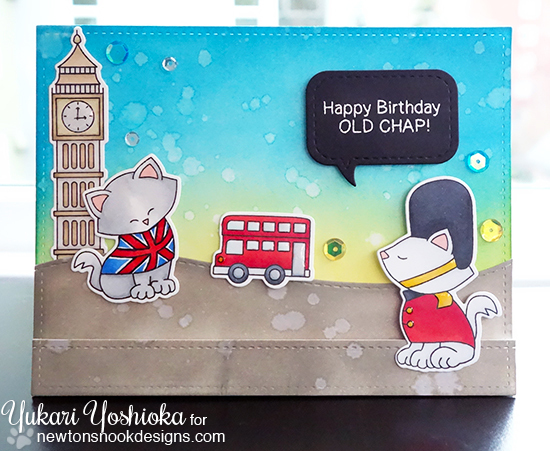 Yukari created a fun birthday card using several of the fun stamps in this set! I love the fun distress ink background too! 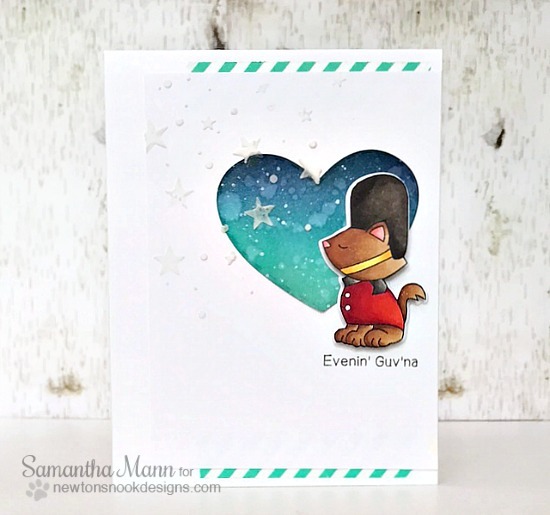 Jess used the fun "Evenin' Guv'na" sentiment to create a fun background of words - perfect for the kitty in his Welsh Guard univorm to sit in front of! This fun scene by Nina-Marie is so cool! I love the night sky with big moon! The kitty floating off with the umbrella is too adorable too! Such a sweet card by Samantha! I love the contrast of the teal and blue heart with the red and black Welsh Guard uniform! This card by Larissa is so striking! I love the black and white icons in the background with the fun shaker and colored kitty in the the front! So fun! This card by Crafty Math-Chick is so adorable! The "I Heart London" border is so fun along with the little thought bubble! Danielle created this super fun card! I love the paint splattered background and is that blue phone booth will be fun find for Doctor Who fans! 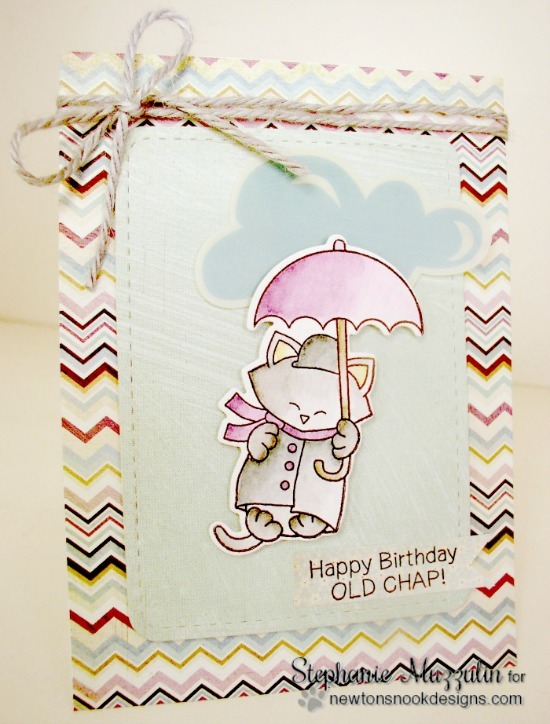 I love the soft coloring and purple umbrella on this card by Stephanie! Perfect for a rainy day! 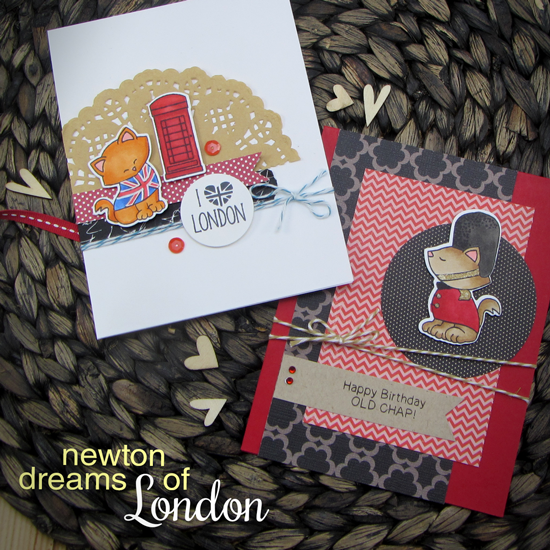 Would you like to win the “Newton Dreams of London” Stamp Set? Comment on the NND blog and Design Team blogs (see list below)! The winner will be chosen at random from the collective blog release posts. Make sure to check out each of their blogs and comment for your chance to win. You will not know which blog has been chosen so the more you comment on the better your chances are of winning! You have until Thursday, March17th at 9pm CST to comment -- winners will be announced on the blog post on Friday, March 18th. Again today I'm blown away by the creativity of your amazing designers, every one of these cards is a knockout! Loving the adorable images in this stamp set! Wow!!! I'm so impressed with the design team's cards!!! Love all of them! Beautiful and very inspiring!!! These cards are very imaginative! I love them all! oh my goodness! This new set is so original and SO very fun!! I thoroughly enjoyed this hop. What an amazing amount of inspiration using this sweet set. OMG this is an AWESOME Stamp set!!!! I lived in England for 4 yrs when I was very little!!!!! LOVE all the DT creations using it too!!!! Happy to see a new Newton set! Oh my great goodness! This stamp set is out of the world! So versatile, so many things you can do with it, the english sayings are just too funny, love them. Design team dis an excellent job! Ohhhhhh! Best Newton set ever!!! I LOVE it! This has been such a great release! I've enjoyed "hopping" this week. I love the adorable images and clever sentiments in this set! The DT's cards are so cute! Ohh my word...! I am in love with this set! I'm gonna have to order right away... Fabulous job Jen! This set is so cute!!! Love it, and the projects are so fun as well! This stamp set made my heart leap with joy! Oh super cute! I love this London version just as much as Newton Dreams of Paris! as they would say in London,,,CHEERS Newton!!! Awww!!!! I'm definitely in love for this set! Too cute!!!! And all these cards are too cutieeeee!!!! This has been a great hop. I love the new images. Love this set! And the design team has made some great cards. Oh my! This set and sample cards are precious! I just accidentally discovered Newton's Nook & think the stamps are so cute. Very fun London themed set--love the clock. What a super fun set and I love what you and the DT did with it! Smashing! Great stamp set. 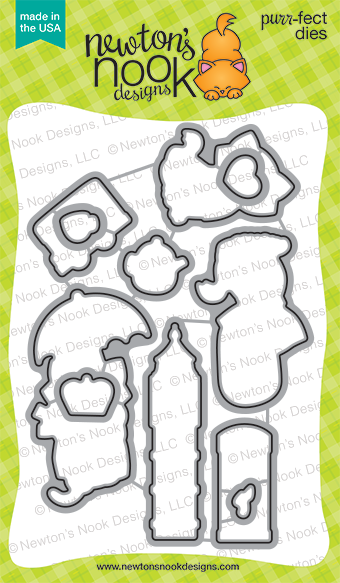 Love newton's nook stamps. Everyone did a great job on there cards, so inspiring. Super fun stamp set. Love Newton with an umbrella. What a fabulous set! I am due to go to London in the summer for my daughter's graduation and this would be perfect to make her a card! My father and all of his family is from Great Britain, so I am very, very happy to see this set! I can't wait to make cards with it for the family "back home"! I truly adore this set! I love all things London and this is right up my alley. I'm also BLOWN AWAY by the samples!!! Doctor Who card by Taheerah Atchia! Spring Coffee Lovers Blog Hop! March Guest Designer - Kelly Latevola! Inky Paws Challenge #29- WINNERS!